The good, the bad & everything else: I need to get that gadget! March has got to be my highest spending month! From beauty spree to holiday trips, I have now succumb to venturing into IT fairs and come out with loots that I'm not sure if I will fully ever use. And indeed, shopping is therapeutic - regardless of what I buy. Of course, I try to not to open my letter box too soon. Seeing the bills sent promptly is a killjoy. 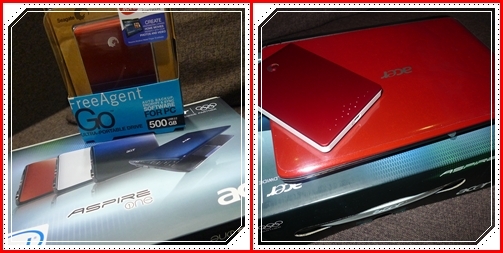 Bought a 500GB HDD to store the heaps of photos and videos of Jayden. Yes. It's only meant to store his stuff and it is THAT MANY. I was about to sieve myself out of the jam when I heard a luring voice over the loudspeaker - "Cheap Sale! Netbook for sale! Only 5 sets!" That froze me on the spot. I pushed the idea of buying a netbook a gazillion times for the fact that I hardly use the com at home. But having to fight with Dylan on who gets the mouse sometimes peeves me. Coincidently, the color was the same as the HDD. Yeah that was what my mum told me. "Money is meant for spending and if you keep it in your bank, money is just numbers." wow! good buy leh! Netbook at $500 nia. cheap. Btw, how much u bought for the 500GB HDD? i also need to get one. yoz babe, i cn only say "great buys"! Haha.. Well done gal. congrats 2 ur hb too on his new job. All e best!